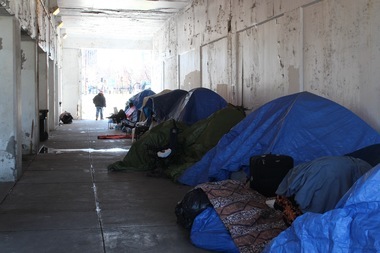 The homeless encampment under the viaduct on Wilson Avenue. CHICAGO — Chicago's homeless population has dropped by 13 percent since last year, according to a count conducted by the city. According to the 2016 Homeless Point-in-Time count, 5,889 people were experiencing homelessness in January compared with 6,786 the year before. 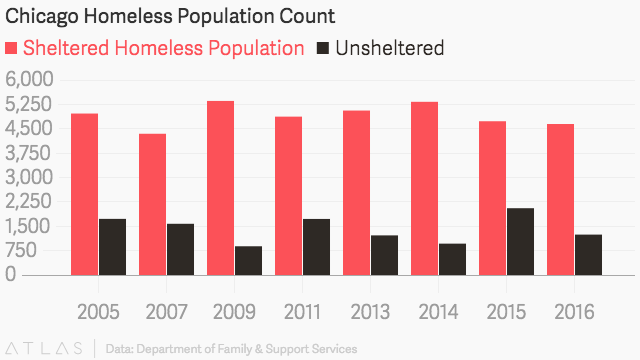 The count found a 22 percent drop in veteran homelessness since last year. Chronic homelessness is down 68 percent and the number of minors living homeless without an adult is down 14 percent. Earlier this year, Mayor Rahm Emanuel launched a task force to reduce homelessness. “While we are encouraged that we have fewer residents impacted by homelessness this year, our work to address homelessness is not done until every Chicagoan has a place to call home," Emanuel said in a statement Monday. The decrease recorded in the count, conducted Jan. 26 when survey teams fanned across the city, may be attributed to multiple factors, said Julie Dworkin, director of policy for Chicago Coalition for the Homeless. In addition to implementing a more exact way of counting people on Blue and Red lines trains, an initiative to get veterans housed may have also helped. The Ending Veterans Homelessness Initiative is an "all-hands-on-deck effort to identify every veteran in Chicago." "It's about coming up with one consolidated list then going through that list systematically working to ge everybody housed," Dworkin said. While the count may have shown a drop with some homeless populations, Dworkin said the count is also flawed because its "narrow" definition of homelessness doesn't include families who are "doubled-up" living with friends or families, instead of on the streets or in shelters. The count also explored how the homeless population was concentrated in parts of the city. Downtown community areas including Loop and Near North Side are near the top of the list of neighborhoods with the largest homeless populations. Uptown's share of the homeless population has more than doubled and accounts for 9.4 percent of all homeless people in Chicago, according to the count.